Sat. Jun 11 to Fri. Jun. 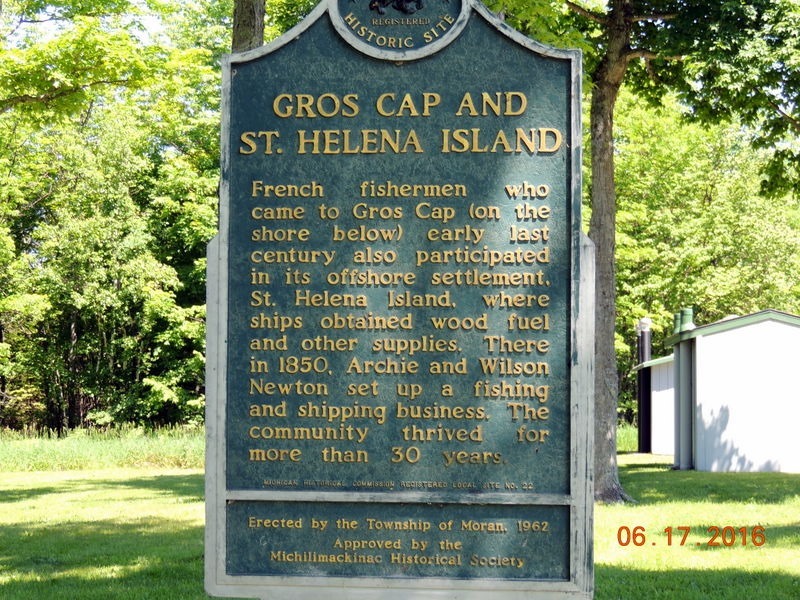 17- Sturgeon Bay WI to Sault St. Marie MI. 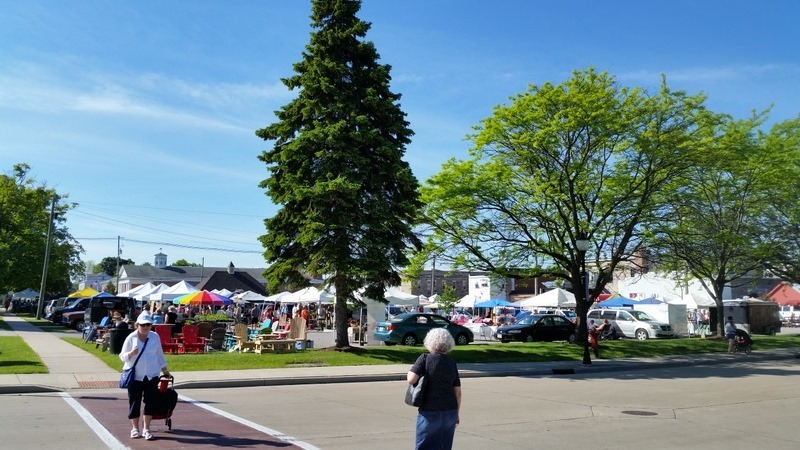 Saturday- We went into the town of Sturgeon Bay to the Farmers Market. It was a very nice little market. We bought some nice morel and leek. cheese, from Renards. Very good! We also purchased spinach, asparagus, and tomatoes. We left there and went a few blocks to the Pig Fest. It was just getting going. There were supposed to be crafts and a run. The run was taking place, but minimal crafts, so we left and returned to the MH. Below is downtown Sturgeon Bay. Bob walked the dogs again, and I put items away. We left and went south to the Sherwood Point Lighthouse. This is the Lighthouse Festival weekend, so there were volunteers there to welcome us. There was a trolley tour, but we decided that at $69 each, that was too expensive. We could do it ourselves, as it was only 5 lighthouses. When we arrived, there were two volunteers sitting at the turn off. They said park on the side of the road. So we did, behind another couple. The lighthouse was a short walk straight up the road, but there was a sign that said turn here. We followed the other couple a short distance. We did not think this was right, so while Bob Googled the lighthouse, I took a picture of these weeds. They are all over the place and are a very pretty purple or white. We backtracked to the lighthouse. On March 3, 1881, Congress appropriated $12,000 to build the lighthouse. The lighthouse was placed into operation October 10, 1883. 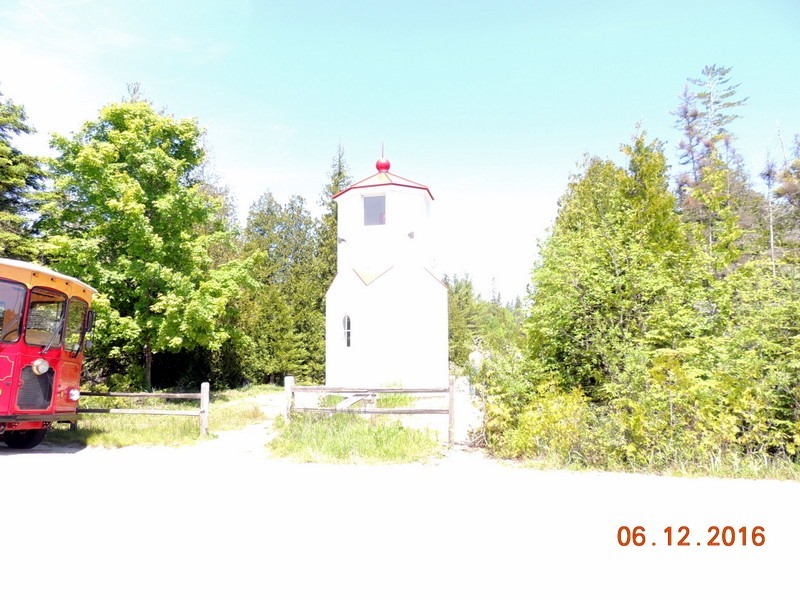 It is the only lighthouse in Door County built of red brick. The tower is 61 feet above the water. This was the last manned lighthouse on the Great Lakes, until the fall of 1983. This lighthouse is rented out by the Coast Guard. It is three bedroom and you can rent it if interested. Go to the Coast Guard website. It would be a nice location while visiting Door County! 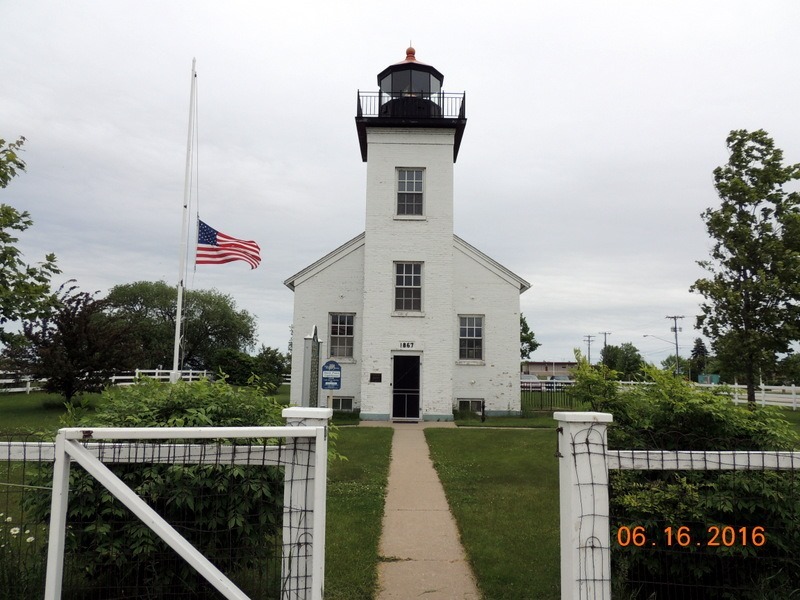 Our next stop was at the Sturgeon Bay Canal Station Light. 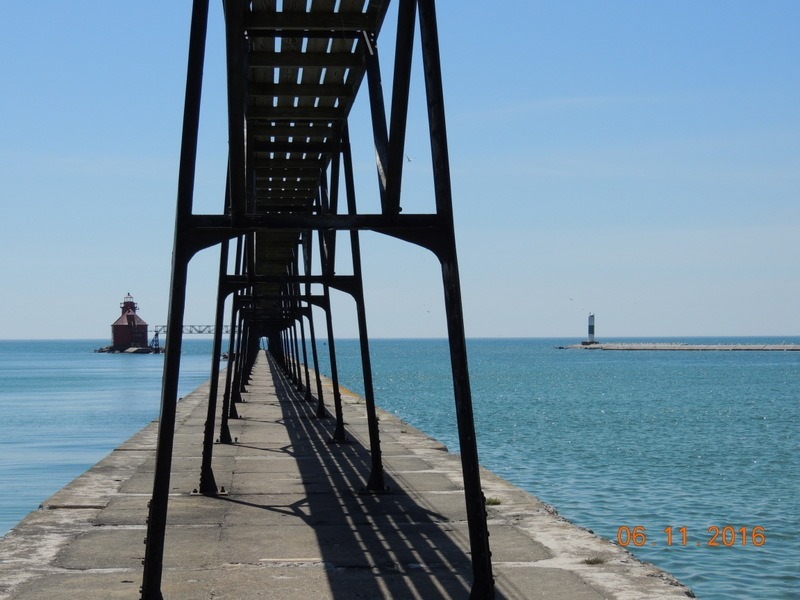 Both of these lighthouses were built due to the building of the canal which connects Green Bay on the west and Lake Michigan on the east. 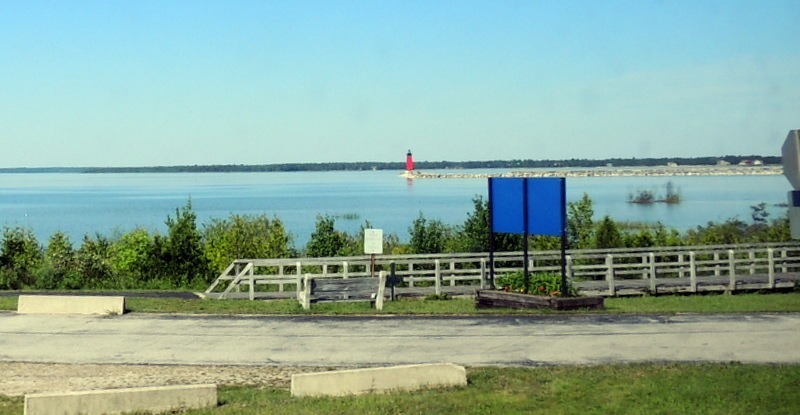 The canal made Sturgeon Bay a very busy shipping port. Congress appropriated the money for the light in 1881. 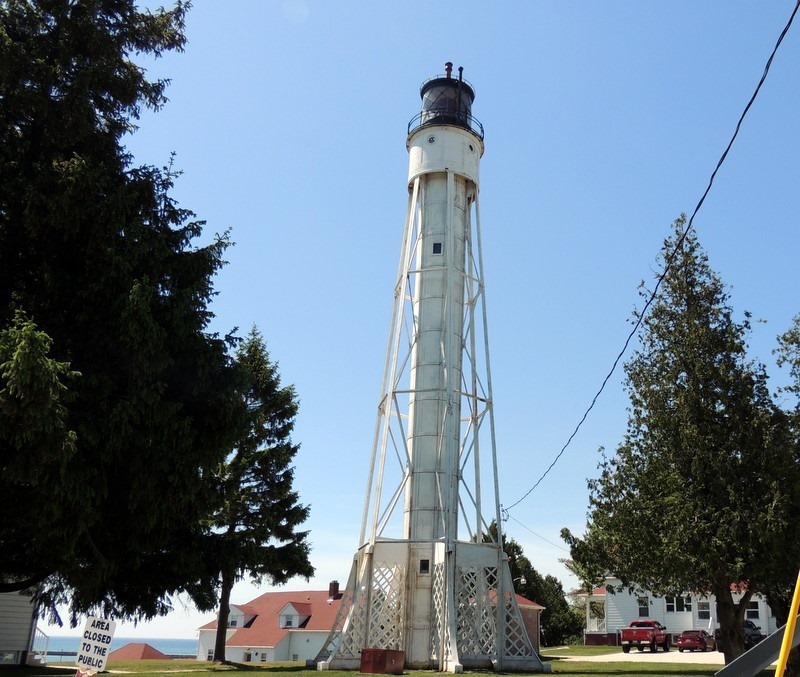 The light went into service on May 15, 1882. The light is located on a Coast Guard Station. When we arrived, the volunteers told us that we have to stay on the public path, as both sides belong to the Coast Guard. We stayed on the path as instructed. There is also a an elevated wall-way from the pier to the fog signals. We left and went to Katie’s Gallery Restaurant in Sturgeon Bay for lunch. I had a nice omelet and Bob had a pulled pork sandwich on a Sheboygan bun with Door County Cherry BBQ sauce! Yummy! We returned to the MH for a nap. We walked the dogs, and ate dinner at home. On Friday, when returning from Washington Island, we stopped at Family Video, signed up for a free membership, and took home Season 3 of Orange is the New Black. We spend last evening and this evening binge watching the DVD. Sunday- We left around 10 AM, after doing the budget, and traveled north on Hwy. 57 to Bailey’s Harbor. 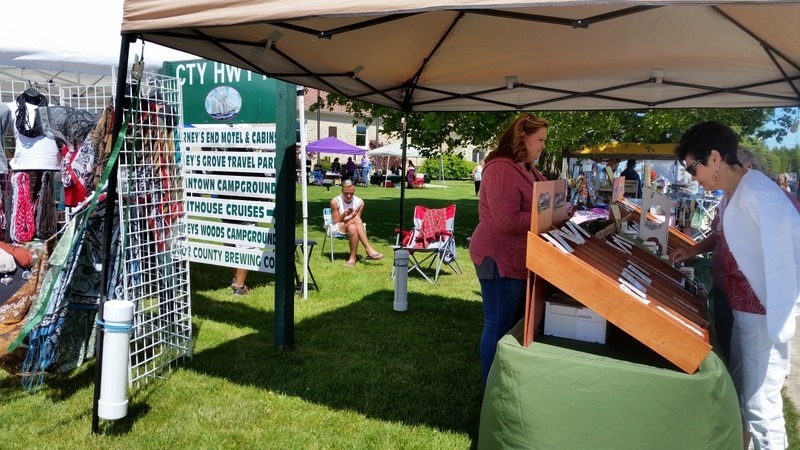 We stopped at the Farmers Market/Craft Fair that was going on at the Town Hall. 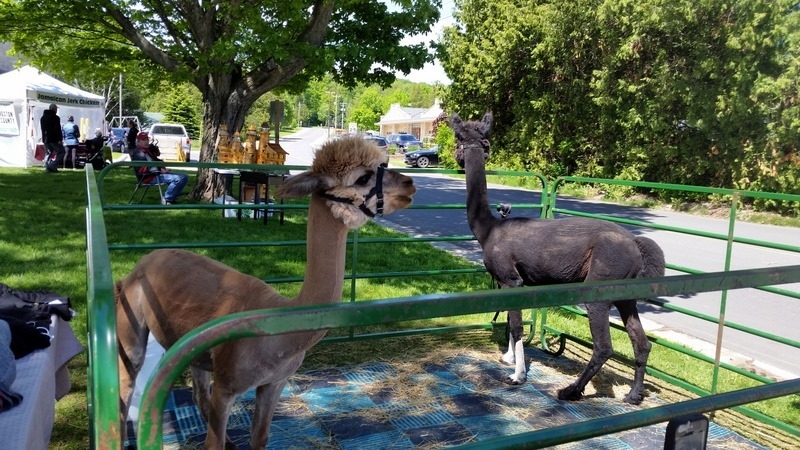 We wandered around, eating food samples and looking at the Alpaca’s. After a quick potty break, at the marina public restrooms, and looking at the mural, we went to the Baileys Harbor Range Lights. There was no volunteers here, but the trolley was there with a tour. We parked and walked to the light, which is right at the road. Sorry the pictures are so light. The setting on my camera changed and I was not aware of it. Fixed now! Behind the light is the second light. The mariner would line up the two lights and head in that direction to safely navigate the harbor. The second light is taller than the first light, so he could see both lights clearly. 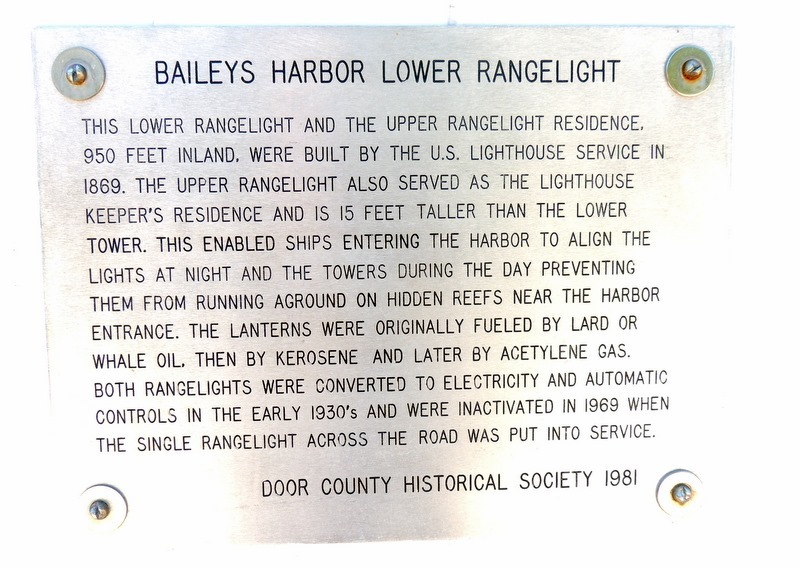 There is also the Baileys Old Lighthouse, out at the entrance to the harbor. It was not open and was on private land. I could not even get a picture of it from the distance. Our next drive was to the Cana Island light. We arrived to find that this light is located on an island, with a difficult walk over stones, and in a state park. There would be a state park fee, so we decided not to do the walk. I am very careful of my left ankle and do not want to take any chance of twisting it on a difficult walk! We were able to take this picture from a distance. We had also by-passed the White Dunes State Park, for the same reason. While we would have liked to see the dunes, we have seen plenty of dunes and did not want to pay the state fees to go take a couple of pictures! That was the end of our tour of the lighthouses. The only one left was the Egg Harbor light and it was also in another state park. 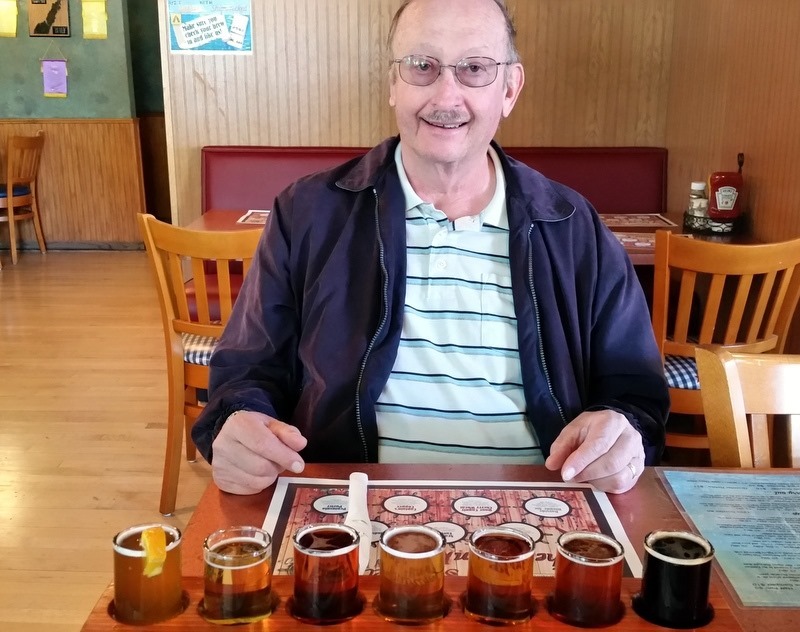 We went to lunch at The Shipwreck, a nice, and very popular brewery. Bob had the flight, and he was a happy camper. He had club wrap and I had the beef brisket “chubby”. It was not all that chubby, and I did not eat the bread! We both took home the potato salad for Bob to have for dinner. 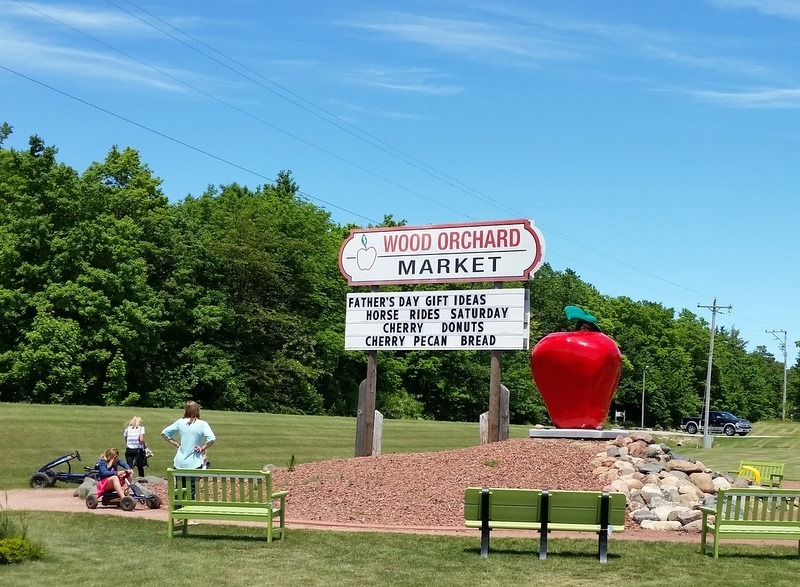 We drove back up north about 2 miles to this nice market. There are a lot of these on the road, and we have stopped at several. There are lots of samples for you to taste. We returned home and kept binge watching Orange is the New Black, finishing the DVD’s right at bedtime! Monday- A quiet day for us. We worked around the MH doing laundry, taking a nap, working in the blog. We watched a DVD in the evening and went to bed. 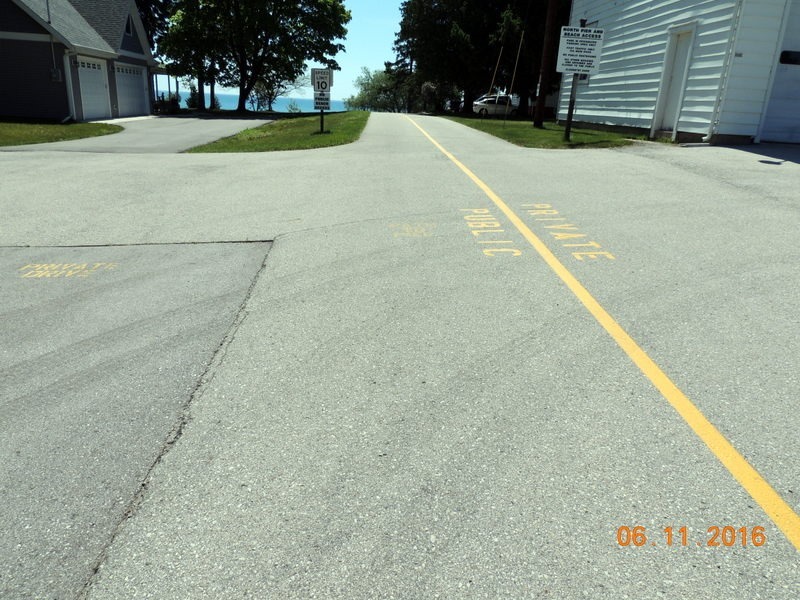 Tuesday- We have seen pretty much everything we wanted to see in Door County and debated whether we want to leave or not. There is not much to see farther north in WI, so we went south to Green Bay. On the way, we stopped at The Shrine Our Lady of Good Help. 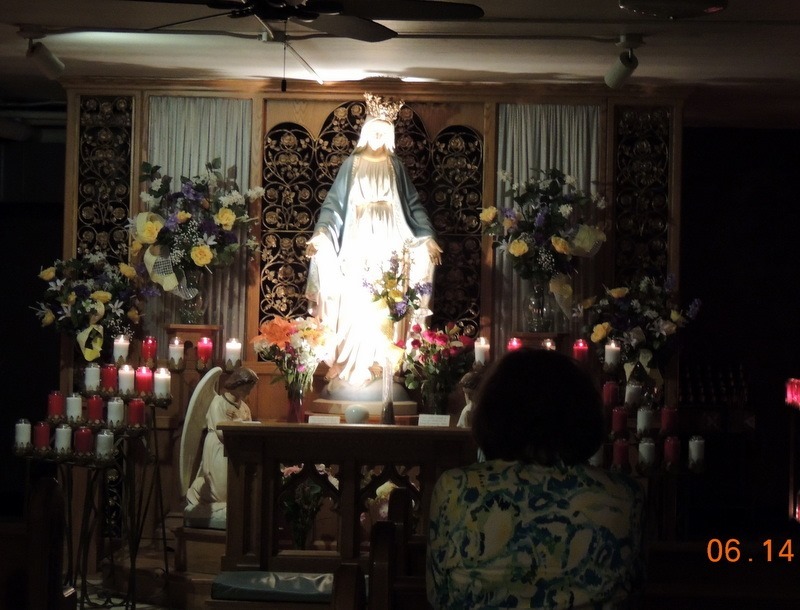 It is the only Church/Shrine in the US that is an approved apparition site by the Roman Catholic Church. 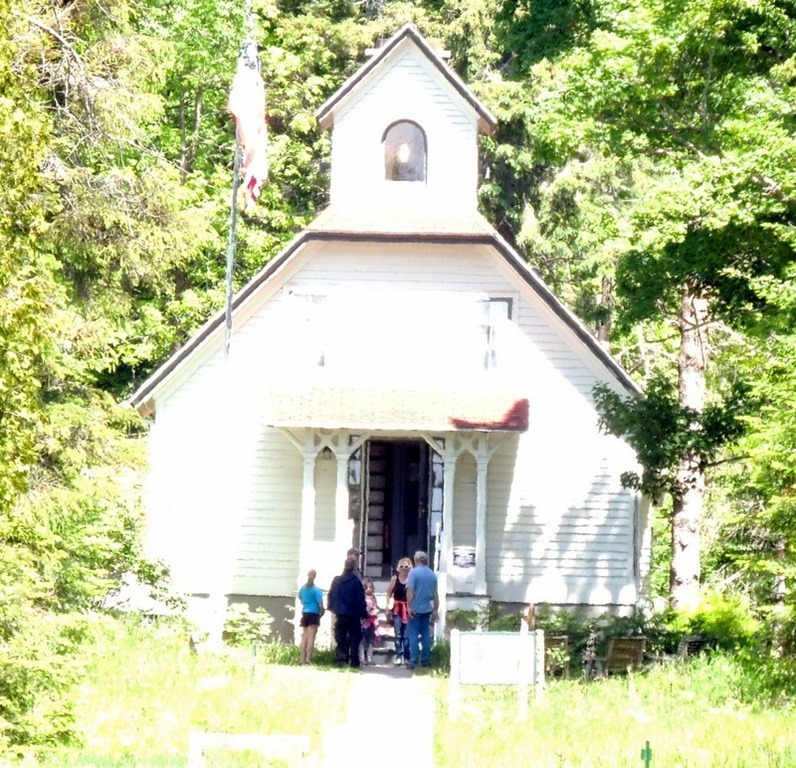 The Shrine is located on 6 acres of farmland northeast of Green Bay. 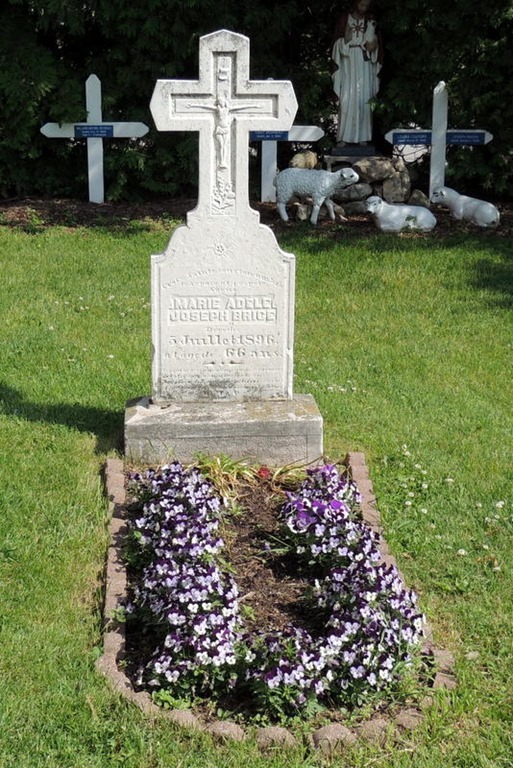 The site preserves the spot where the Queen of Heaven appeared to a young Belgian immigrant woman named Adele Brise in 1859. Pilgrimages are still occurring at this site, and people have been cured of various illnesses. We walked to the side of the current church and descended the steps into the area under the church where the apparition took place. On the right is Adele’s grave. We left and continued south to Green Bay. We had not purchased gas in Door County because it was so expensive, so we went straight to Costco for gas, $2.45 vs. $2.79 in Door County. We also did a little shopping. 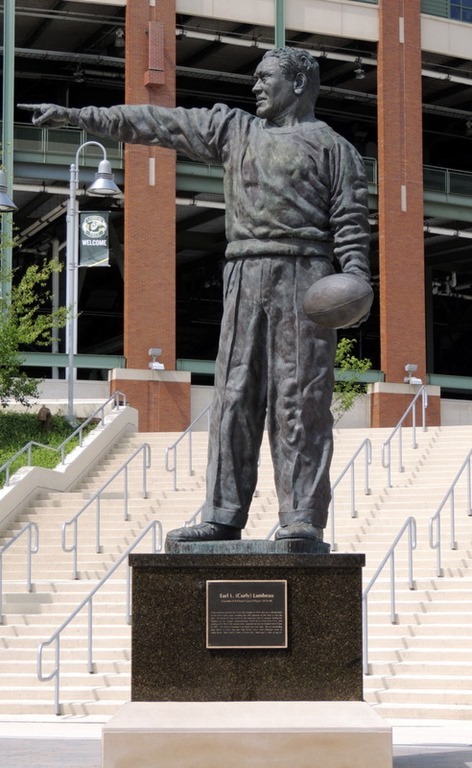 We continued on to Lambeau Field. 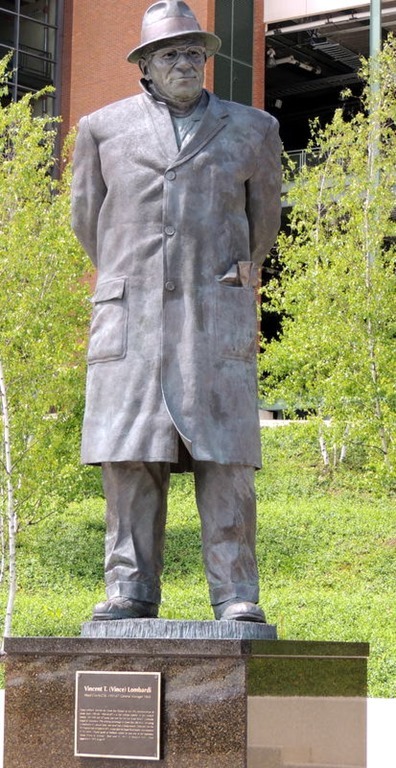 Out front where these statues. Green Bay is all Packers! The buses are painted green and yellow as are all the trash cans. Across from the stadium are houses and most of the fences are painted with Packers symbols. There is a tour of the stadium for $12 each, but since we are diehard Redskin fans, we passed. 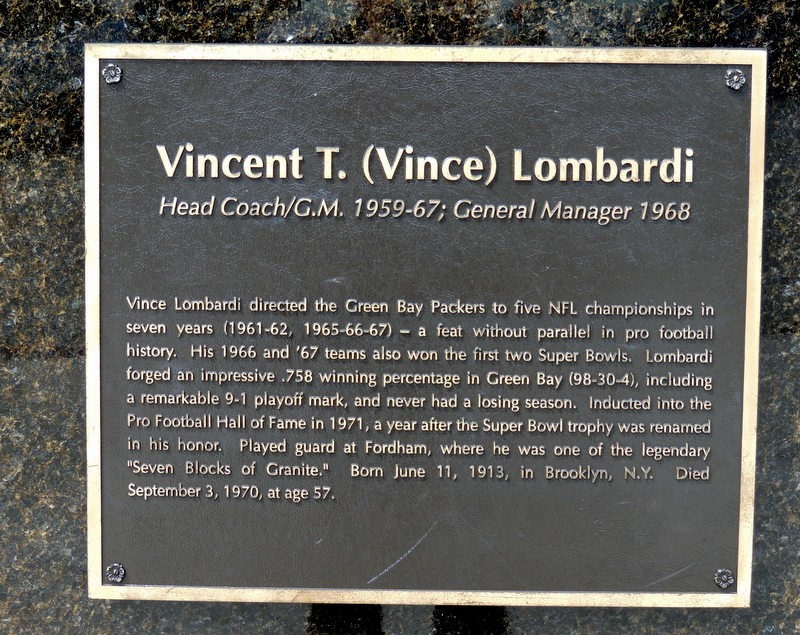 Not only is it a tour of the stadium, it is also a tour of the Packers Hall of Fame. Not interested! We stopped at Kohl’s to buy new clothes. Bob desperately needed to shirts as his old ones were way too big. Both of us are continuing to lose weight. We went to lunch at the Bay Family Restaurant. Bob had found the restaurant on Yelp and it had good ratings. We knew it was a good choice when we arrived, as the parking lot was full. The food was good, but the service was mediocre. We thought we would go downtown to see the city, but there was not much to see. No old buildings or high rises. We left and returned to the MH. We had gotten two DVD’s, and last evening had watched The Martian, so today we finished the second DVD, then returned both of them. We decided to stay until the end of our reservation at the RV park, since it was already paid for and the weather forecast was for rain. Wednesday- I woke up at 5 to pouring rain beating on the roof of the MH. So glad we had the roof sealed! Since we are leaving for Canada on Saturday, and will be too close on Friday, as the cell’s will ping off the cell towers in Canada, we worked on getting the cell phone plan updated so that we can get Canada. We are going to use my phone, as it is connected to the printer. We also let our credit card companies know that we will be in Canada, so that we can use our cards. None of our cards have a fee for out of the country. We also double checked our itinerary, and Bob found a Super Walmart that we can stay in. I had planned on us staying in an Elks Lodge parking lot, but Bob decided that the parking lot was too small. So he called the Walmart and we have permission and need to check in with them so they can send us to a designated area to stay in for the night. We did a lot of laundry, watched the last DVD, and returned it. Thursday- We left around 8:45, driving south off of the Door Peninsula. 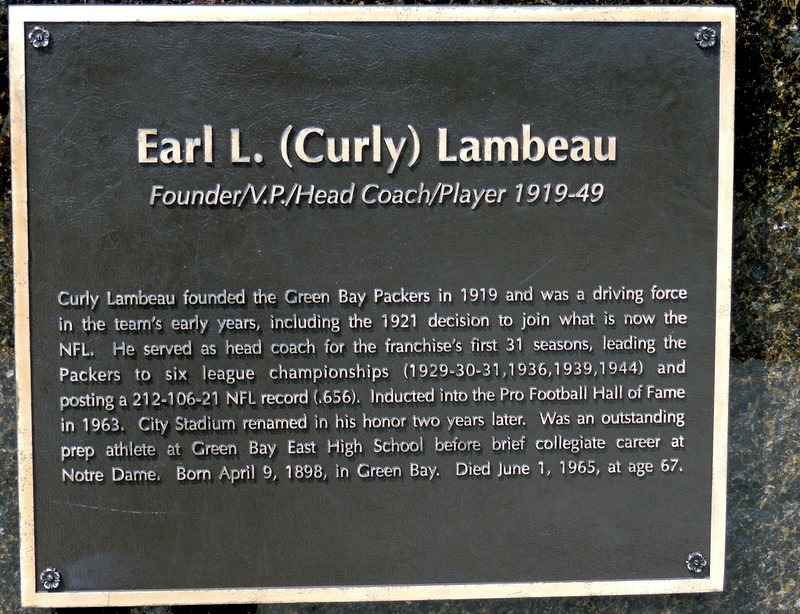 We drove around the Green Bay, and started north on Hwy. 41/141. 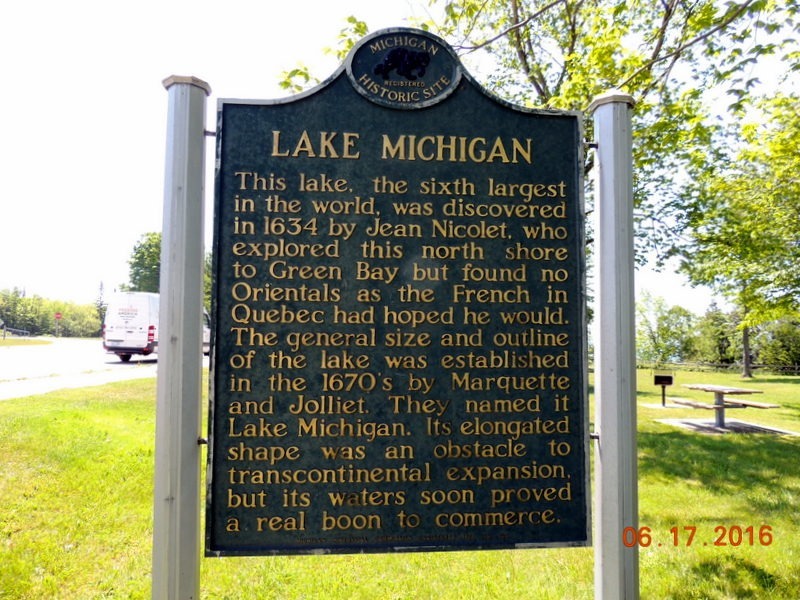 We continued north along the Green Bay, and entered the UP of Michigan. Our destination, 155 miles, to spend the night in Escaneba MI, at the UP State Fairgrounds, $20 for 50 Amp W/E. On the way, we saw this lighthouse on a bay near Marinette, MI. Just as we were entering the town of Escaneba, we saw a sign for a lighthouse, so once we set up, we went to visit the lighthouse. 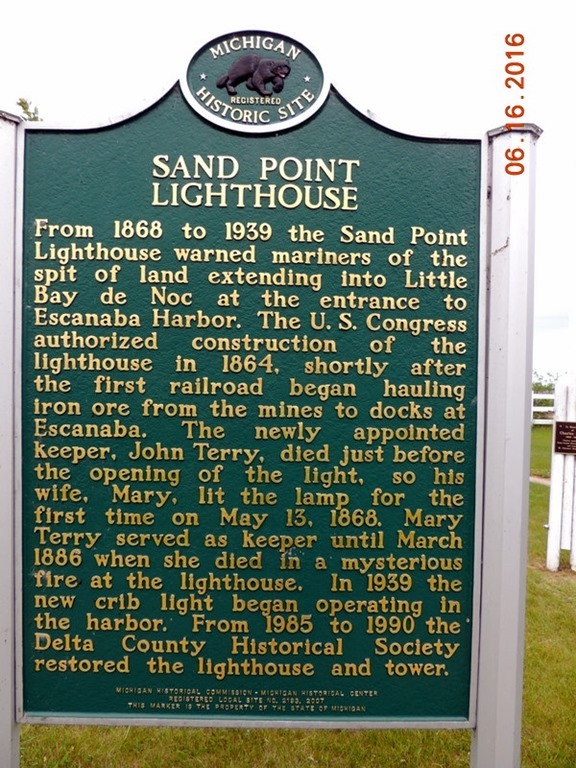 Below is the Sand Point Lighthouse. We settled in to spend the night. We were the only people in the fairgrounds, although, there are races scheduled for tomorrow, so it will become busy. Friday- We left the fairgrounds and continued north on HWY 32, turning northeast on Hwy. 2 to cross the UP of Michigan. This route was a little longer, but much prettier than just the trees in the UP. Below is a wayside. What a view! Note the lighthouse in the distance. At a wayside, we found this sign. 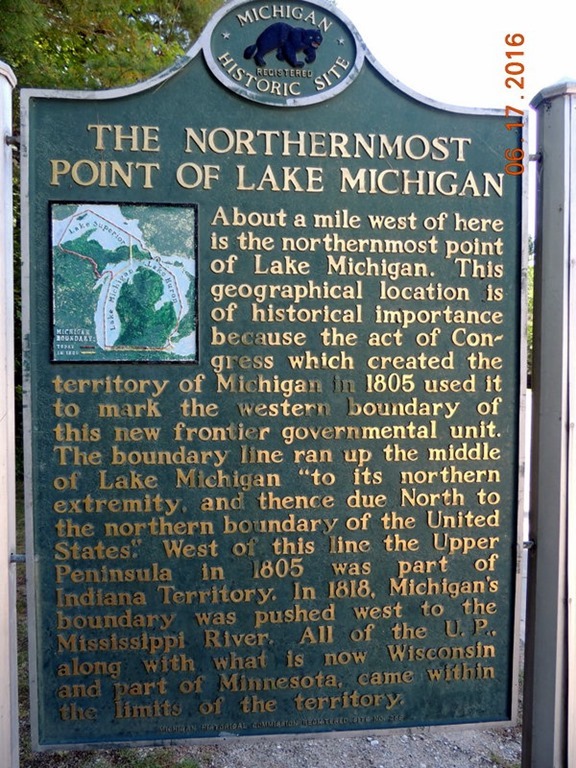 Here is the northern most site. Above is the St. Helena Island Lighthouse. 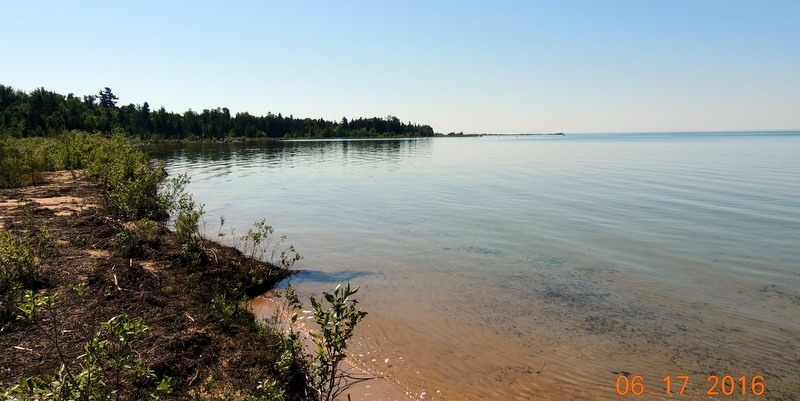 We continued to I-75, and turned north driving up to Sault St. Marie,MI. We stopped at a gas station for diesel, then continued on to the Elks Lodge. We had looked at this Lodge when we visited this area in 2014. We drove in and there were no cars in the parking lot and one 5th wheel parked. There was a teenager sitting outside working on something. Bob walked over and asked him if we could park. He called an Elk Volunteer, who said that it was $40 per night. Huh? It was $11 in 2014, There was an RV park about a block up the road, but we thought if the Elks was $40, then the other RV park would be at least that much. We parked and set up. It was pretty awful, with a potholes in the driveway and the picnic tables were in bad shape. We backed into the site, which had 50 amp and water. There was supposed to be cable TV, but the someone had cut the cord with the lawnmower. The worst part was that there was goose poop everywhere. I ran around with one of our dog poop bags picking up the goose poop so we would not step in it. This was significantly worse than all the poop at the Jellystone park! We went to get gas for the car. We turned and drove farther down the road and there was a county park, not far from the Elks, which had a nice RV park. We stopped in and spoke with the Host. It was $30 for W/E and $32 for water front, 30 or 50 amp and water. It was much nicer than the Elks! We bought the gas, then returned to the Elks Lodge. Now there were several cars there and the door was open. We went in and spoke with Pat, a volunteer. He greeted us and said you must be RV’ers. We said yes. How much was the site? He said $40. I asked was that the Elks price and he said yes, the same for everyone! I said that was too much. He said they had raised it because they were having financial problems. I said that we would have to leave as the price down the street was $30. He said he thought it was $40. We had a brochure from the county park which listed the prices. He said why don’t you pay what you think is fair, so we paid them $30. It was easier than moving, and we would prefer that the money go to the Elks, but we did not go to dinner at the Lodge, which we would have if it was still $11, plus the dinner was fried. The nice thing about the Elks was the view. It was right on the water and we could sit and watch the ships go by. We sat outside until it starting getting cold. We had to keep the dogs in ou laps so that they did not eat any of the goose poop!